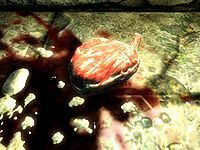 Human Flesh can be found in locations where people have performed the Black Sacrament ritual to summon the Dark Brotherhood (along with human hearts), and in a few necromancer dungeons. Flesh cannot be taken from dead humans. It is easily overlooked because it looks like raw beef. Rare-type apothecary's satchels have a 6% chance of containing one. Falmer magic casters, warlocks, and Forsworn have a 0.7% chance of carrying one. With the Dawnguard add-on, dead werewolves will always carry one sample of human flesh, as well as one wolf pelt. With the Dragonborn add-on, dead werebears typically carry one sample of human flesh. This ingredient cannot be sold to apothecary merchants; it can only be sold to general goods merchants.